Welcome to the Spring 2018 edition of the PowerChurch Software newsletter. In this issue, we say farewell to an old friend, say hello to a new friend, and shine a light on a well-hidden and super useful feature. With the release of PowerChurch Plus Version 12 in November, the time has come for Version 11 to begin its well-deserved retirement. We issued the final Maintenance Release for Version 11 last month. Version 11 was originally released in November 2009, making it by far the longest we have ever kept a single version under maintenance. As always, we will continue to support Version 11 users, there just won't be any new bug fixes, updates of the tax forms, or other things normally distributed via Maintenance Release. To see a list of what has been added or changed over the years in newer versions of PowerChurch Plus, visit https://www.powerchurch.com/changes. As shown in the quick video below, Version 12 has added a new data entry screen that allows you to change the Personal Status Codes of all family members at once. On the Integrated Data Entry screen, click the "Edit Personal Statuses" button, which is conveniently located just below the Mailing Category field. So, when a family's status changes, such as moving out of the area or visitors becoming members, you can update everyone all at once. This saves you from having to look up each individual profile and change their Personal Status code one at a time. 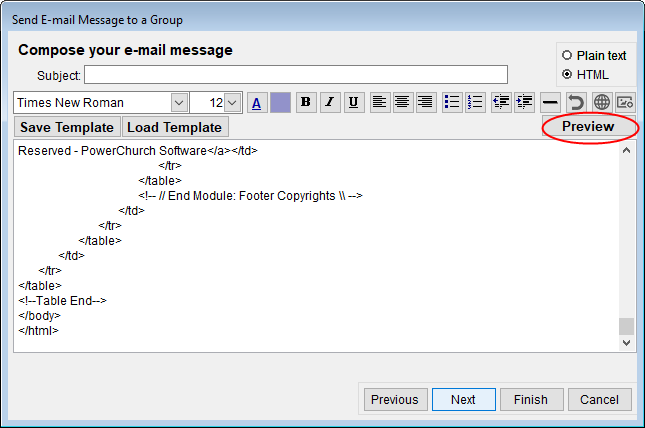 Version 11.5 added the ability to save and load e-mail templates, along with the ability to view and edit the HTML code in the e-mail body. This lets you use much more complex e-mail layouts, such as those purchased from sites like ThemeForest or other providers. 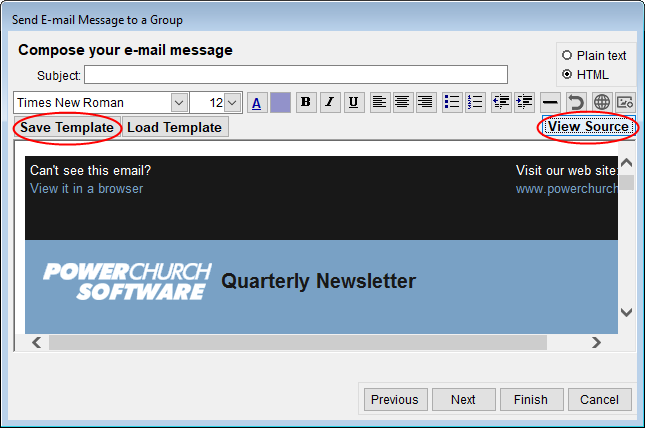 In writing this article, we thought it would be appropriate to use the template for the PowerChurch Software newsletter, which was purchased from ThemeForest. You can send bulk e-mails from various areas of the Membership menu in Version 11.5 (and even more places in Version 12), but for this example, we're just working in Personal Profiles. So to start, go to Membership > Personal Profiles > Send E-mail Message to a Group. Make any necessary changes on the Selection Criteria screen and click OK, then choose what you would like to do with profiles that don't have e-mail addresses. 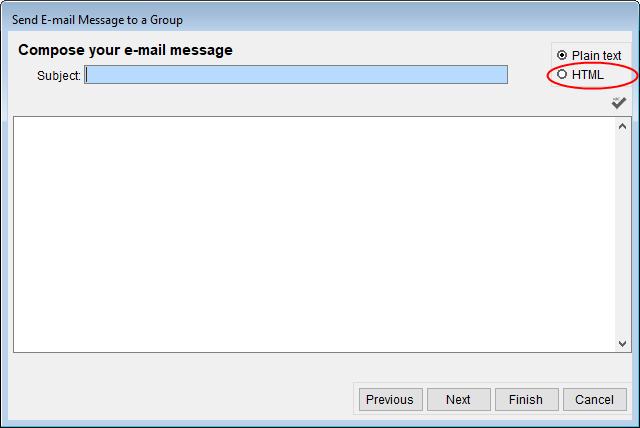 The next step is where the actual e-mail subject and body is composed. Choose HTML formatting at the top right. 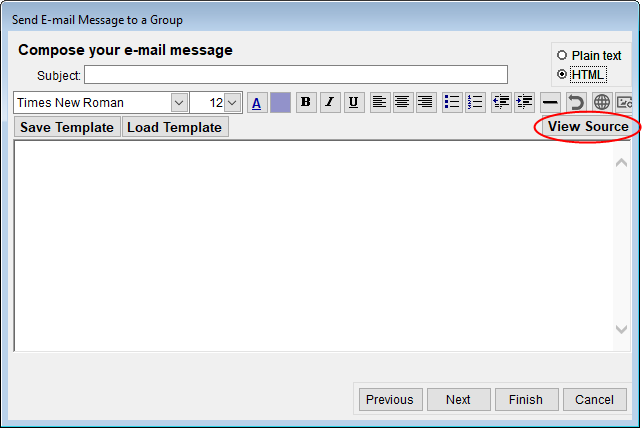 This will display the formatting toolbar, where you can change the fonts, colors, add links, etc. If you have HTML code you would like to work with directly, such as you would get with a purchased template, click the View Source button, and then copy and paste your code into the e-mail body. When finished editing the HTML code, click the Preview button to see the fruits of your labor. You can click View Source again to switch back into the HTML code, make some changes, and then click Preview to verify the changes you made. 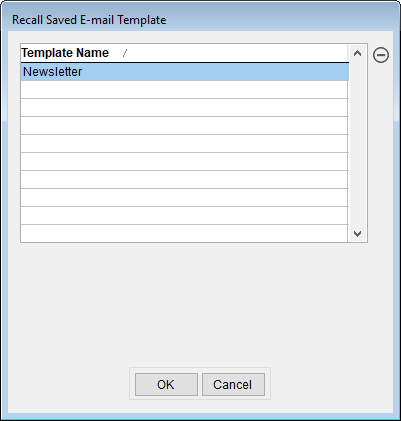 When you are happy with the layout, click Save Template, assign it a title and click OK.
Next time you want to send an e-mail, come back into the Send E-mail Message to a Group screen, change it to HTML, and click Load Template. 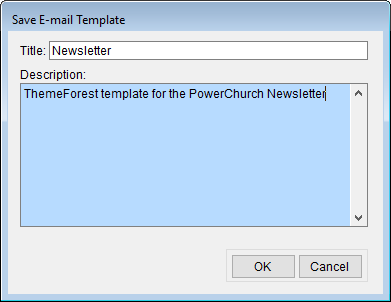 Choose your saved template and click OK.
Q. I placed an order for PowerChurch checks from Dynamic Systems. I was told by the Dynamic Systems representative that check numbers will appear twice - the number that is already preprinted on the checks and the check number from the software. Is this information correct? A. That is correct. The check numbers should be preprinted on the check stock you purchase from Dynamic Systems. When you print checks from PowerChurch, it prints the check number on there as well, so you can see that the checks were loaded in the right order and the numbers PowerChurch assigned match the preprinted numbers on the checks. Q. For some reason I can't grasp when or why I should be voiding a check or reversing the transaction or does it matter? I am in Version 12, have something coded to the incorrect account in a long list of accounts on one check. Do I void the check and enter a transaction or reverse the transaction and re-enter? A. To maintain the audit trail, I always void the original check, and enter a manual check using the same check number. Reversing it in Fund Accounting always displays a warning saying the transaction came from another module. If you reverse and reenter it in Fund Accounting, then the Accounts Payable reports for that check will be different. Q. I need to create a statistical report that will group yearly contribution summaries by age group. Is this possible to do in PowerChurch? A. Version 12 has a report called Contributor Age Ranges that breaks down the count/percentage and amount given/percentage of contributors by age range.